The conference will take place at the Universitat de les Illes Balears (UIB) Campus. Lectures will be given in the auditorium of the EHIB Building. Take bus number 1 at the airport, right outside “Llegadas” (arrivals), price: 3€, with a frequency of 16 minutes (tickets are bought from the bus driver, with cash; maximum allowed banknotes: 10€), until Plaça d'Espanya (centre of Palma). Alternativelly you can also take a Taxi from the Airport to Palma. Taxis can be found just outside the Airport Arrivals Hall. The price depends on the number of suitcases and time of the day, typically between 20 and 25 euros. This is the recommended transportation between Palma downtown and the UIB campus where the school will take place. Take line M1 which starts in Plaza España (marked as Estació Intermodal in ticket machines) and ends in the UIB campus. Travel time is 13 min. Ticket price is 1.50 EUR. Tickets can be purchased at the ticker machines located in the station hall (bills larger than 20 EUR are not accepted). Keep the ticket until the exit, since it is needed to leave the station. A map together with the schedule of the M1 line can be found here. The walking distance between underground in campus and the conference venue is around 20min (see map below). You can also take the bus line 19 (labelled as "Universitat"), which will leave you near the conference place EHIB building (bus stop 1101-C.Esport-Residència, the second stop when entering the Campus), ticket price 1.50 EUR. Bus frequency is about one every 15 minutes. Trip time is about 30 minutes. Tickets can be purchased from the bus driver (bills larger than 20 EUR are not accepted). Bus line 19 route can be found here. 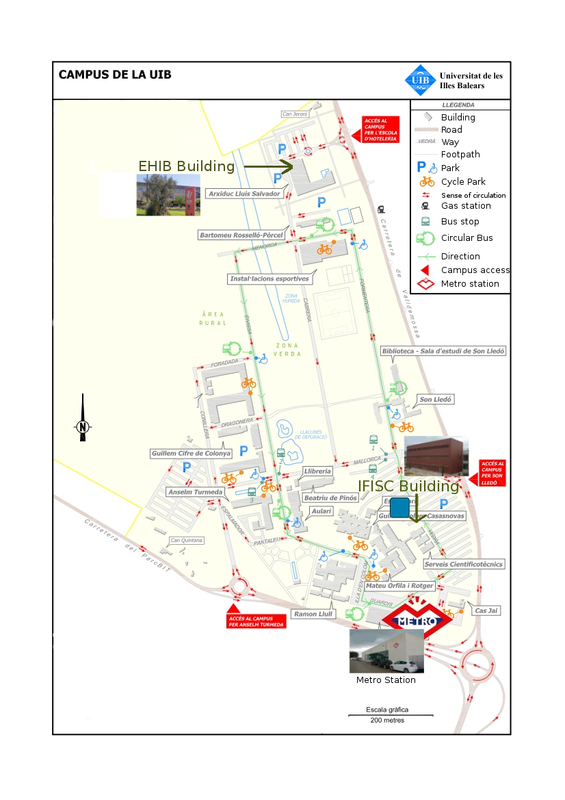 The walking distance between bus station in campus to venue is around 2 min (see map below). How to reach EHIB building from Metro (UIB station). With public transport you need to go to the city center and then to the campus (instructions above). Taxis can be found just outside the Airport Arrivals Hall. The direction for the taxi driver is "Escola de Hoteleria, Universidad Islas Baleares". It should take 15', if there is no traffic. The price depends on the number of suitcases and time of the day, typically around 25 euros. Restaurante Chiliss nº3, (Moll Vell) local nº3, Carrer Muelle, Palma. From Plaza de España 20' walk through the city. We recommend booking accommodation as soon as possible since hotel occupancies after Easter in Mallorca is already high. A good compromise price/proximity is Hotel Abelux (http://www.hotelabelux.es). Other options with higher category but still near public transports are Innside-Palma (http://www.melia.com/en/hotels/spain/majorca/innside-palma-center/) , Hotel Almudaina (https://www.hotelalmudaina.com/), or Ur Palacio Avenida (http://www.urhotels.com/ur-palacio-avenida---adults-only).